Cereal for breakfast is everyday fare at our house, with the occasional omelet or batch of pancakes thrown in. 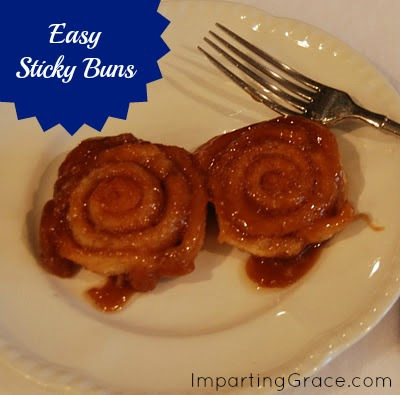 Every now and then, though--usually when begged by my boys--I love to make these wonderful Mini Sticky Buns. They're very easy to make, and they couldn't be any more delicious to eat. Preheat oven to 375 degrees. Spray two 8" or 9" square pans liberally with non-stick cooking spray. Melt butter. Combine with brown sugar and corn syrup. Divide evenly and spread in bottoms of the two prepared pans. Open crescent rolls. Unroll dough as one sheet. Pinch perforations together so that you have a seamless sheet of dough, then roll into a rectangle of about 9" x 15" (don't worry; it doesn't have to be measured precisely). Note: If you can find these packages of Crescent seamless dough sheets, they're perfect for this recipe. Sprinkle sheet of dough with half of the cinnamon sugar. Then, starting with one of the short ends, roll the dough up jelly-roll style. Using a sharp serrated knife, cut the roll into 9 one-inch rolls. Place rolls in pan, right on top of the brown sugar mixture, in three rows of three. Be sure not to crowd them too much; they'll rise in the oven. Bake at 375 degrees for 13 minutes. 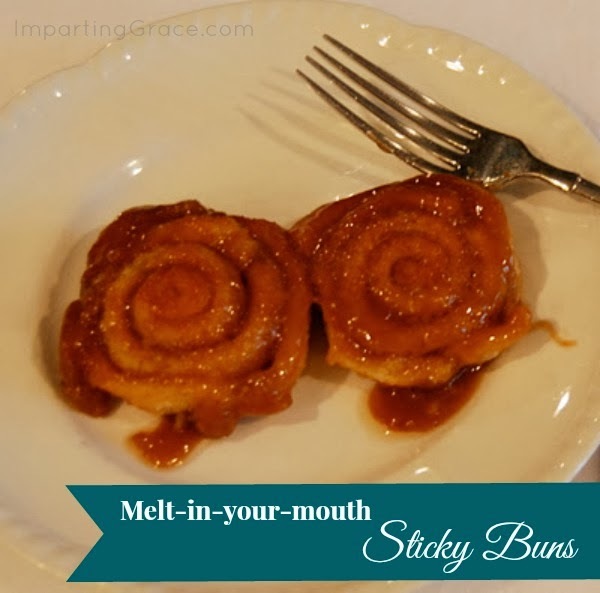 Remove from oven and let cool slightly, then serve by scooping a roll along with the yummy sticky mixture underneath and flipping it over onto a plate, thereby placing the sticky mixture on top of the roll. I suppose you could also invert the whole pan onto a plate so that the sticky part would be on top. However you serve it, you're going to want to eat it right away! If you have any leftovers, they'll still be delicious later. You'll just have to warm them a bit in order to serve them, because the gooey topping gets fairly hard when it gets cold. If you're like us, though, you might not have any leftovers. I keep all these ingredients on hand, so these are perfect for a snow day. . . except we haven't had any snow days this winter! We're all longing for a lazy day inside. What about you? **I'm joining Beth at Home Stories A to Z for Tutorials and Tips. It is a great idea for a quick treat for company...or family. But if I made them, I would want to eat the whole pan! Ha! I make these, too! Such a wonderful quick fix, but you can't eat just one! These look delicious, Richella. I've heard of those cresent roll sheets, but I keep forgetting to check my grocery store. I'll put that on my to do list. These look awesome! I am definitely longing for a snow day where I could stay indoors and enjoy a yummy treat like this. They look SO good! Wow, these looks so easy and yummy!! I've never seen those crescent seamless things! So cool!